This is a wonderful Los Angeles (LA) establishing shot, or simply a travel establishing shot, captured in stunning UHD 4K with a full frame sensor on a gyro stabilized camera aboard a real helicopter. The clip begins with a jet airliner slowing on the runway after landing at LAX (Los Angeles International Airport) and we smoothly track the airplane as it moves from left to right while rolling out under a clear night sky. 4K Los Angeles International Airport LAX Night HD was captured with a cine-like shutter speed of 1/48th of a second and a frame rate of 29.97 FPS. Like all of our UHD 4K stock footage, this clip is also available in high definition (HD) in both very high quality and more affordable h264 versions. This airplane stock footage beautifully illustrates modern air travel at an international airport. Running time is 16 seconds and it is silent (MOS). With inexpensive stock footage purchase options, the price is amazing for Los Angeles aerial stock footage of this quality! 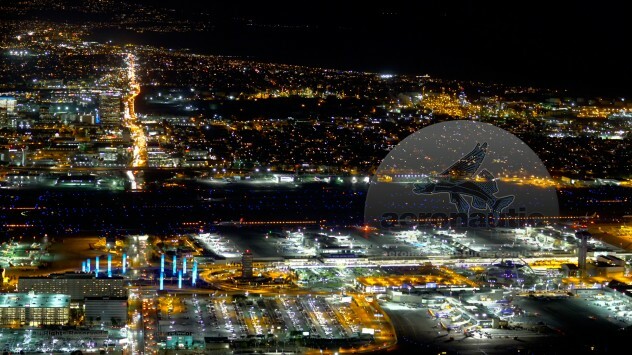 4K Los Angeles International Airport (LAX) Night Aerial Stock Footage – Download Royalty Free – Ultra High Definition stock footage. Buy it now! Please note: We have many individual aerial stock footage clips. Only a small percent are in this shop but we are adding more for you to download all the time. Meanwhile, please use our contact form if you don’t see the high definition or UHD aerial stock video you seek. We have Los Angeles aerial stock footage, train aerial stock footage, beautiful nature aerial stock footage, farm aerial stock footage, you name it!